Week 2 started today, but I stayed in HCMC to get more information about the severe flooding in Binh Dinh Province, where Qui Nhon is located. I woke early at 6, even though I went to bed at 1am, and got up. I did some exercises and took a shower with hot water. Found the buffet again at the Coffee House, and sat with Kjetil Engen from Norway. He is here chasing a Vietnamese girl he met on a previous vacation, and it was pleasant to have someone to chat with while we enjoyed omlettes with meat, fruits, toasted French bread with butter and marmalade, and unlimited coffee. The meal didn’t hold up on a second scrutiny, most of it was just a little inferior, but it was comfortable and copious. I wandered over to Singh Tourist, and talked with two lovely young ladies. One was almost fluent in English, she is an American over here on an internship from California, My An Ngo. She told me the road to Qui Nhon was open, but I doubted their expertise, since they seemed unaware of serious flooding. After some back and forth, I booked a ticket for tomorrow at 7:30 AM to Mui Nei, 5 hours, then Saturday, going to Nha Trang at 1, another 5 hours. Cost, 202kd, or $11. Since their only bus to Qui Nhon is an evening and night affair, I will find another company to do the last leg to Qui Nhon, if it turns out to be open, and go up into the highlands and around to Hue if access is flooded. I returned to my hotel, then took off for the Museum of HCMC, a big old French colonial building. I took notes of facts of interest to me. The museum had lots of information in Vietnamese and English, such as, The dry season for the city is Dec-April. The Rainy season here is May through Nov. The average temperature is 27 degrees C.
The ecology is evergreen and deciduous, and swamp forest. Date palms, shrubs and dune vegetation of salt marshes. There were several rooms of ceramics, from 10,000 years ago to the present. I took many photos, there was an entire floor of stuff about the resistance to the French, and then the war against the Japanese, then the French, then the Americans. By 1:00 PM, I found a place down the street for a meal of Pho with chicken, noodle and beansprout soup, and sat next to a nice Viet Kieu couple form Las Vegas, young, attractive and wealthy, and it was pleasant to have company. He had been a pilot in the US air force, then a police officer in LA, then a business man, building and then running dry cleaning stores. He thinks global warming is a hoax, and that Al Gore made it up to sell his book and movie for profit. After lunch, I walked 30 minutes to the Botanical Gardens, which I walked about, noting the names of the trees from their signs. There were gigantic African Mahogany, Huile de Bois, Sandpaper Tree, Wal Gona, Prunier de singe, Sudu (Idda, Plalay), Java Plum (Jambal), Alexandria Laurel. The Botanical Garden was the only place to see great, old trees during my travels through the coastal regions. In three weeks of travel, I saw no large trees surviving outside the Garden. I wandered over to the 3 Asian elephants, they seemed very small for elephants- seven, not fourteen feet tall. Near the far entrance, I found the Museum of History, in a large building that looked like it was once a Buddhist temple, or was built to resemble one. I learned that Vietnam has 54 ethnic groups, many Malayo-Polynesian languages. It had a metal age 4000 to 2000 years ago, during the period of Van Long, Au Lac. There was a bronze drum from 2500 years ago. Siamese aggressors 1784-85, including the Battle of Rach Gam- Xoui Mut in 1785, at My Tho. They defeated an army of 50k Siamese. There was a mention of the Tay Son Dynasty. The Tay Son Insurrection was dated at 1771, over the Nguyen Lords. They defeated the Siamese Aggressors, over through the Trinh Lords, then wiped out the Le Dynasty, and annihilated the Qing aggressors. There were some beautiful scrolls behind glass, full of Chinese calligraphy, and red chops, the first was Emperor Quang Trung’s Royal Order on Agrarian Policy, 1790, on agrarian taxes, 1790, and a third by Quang Toan. The wall also said that Quang Trung routed the Qing Aggressors in 1789. I came out of the museum after buying a Viet phrase book, and found a motorcycle cowboy, or he found me, since he was standing in a group of them, and he gave his price as 50kd, I said 20, he said 30, and then he wouldn’t budge. He said it was too far to go for less. I caved, first time with a cowboy, and he drove across the city like a madman, at one point it was so busy he couldn’t get through a mob of cycles to turn left, so he drove at the oncoming traffic, slowly moving to the right as oncoming vehicles swerved to miss us. I told him twice to stop rushing, or he would kill us both. I had walked much farther than I had realized, and he was right, it was a good distance back to my hotel. I met with the gorgeous reception clerk, Quyen, pronounced Queen, and reviewed my bill, which I paid using my credit card. $51 covered $5 for the upgrade for 2 days, two days at $20, and about $5 for three small batches of laundry, and 3% for using the CC. It started to pour outside, so I took my computer downstairs and reviewed emails, and proofed my journal, to send out to a short list of people, including my 3 children, who I haven’t heard any news from yet. I walked around the corner headed for a restaurant, but got interested in a little open room place that was serving fried open mouth white fish. It was fabulous, with rice and iced tea, for 45kd. Further up the street on the next big boulevard, I found a doughnut shop selling ice cream, and for 38kd I got two scoops of fancy ice cream that was good, but different. Probably not cow’s milk, and less sugar that we use in the States. I was invited to take my plastic bowl up upstairs, where you took your shoes off on the stair case, and the loft had low tables with red pillows the shape of doughnuts, and had 5 teenage couples. I felt like the Old American, but I slipped out quickly. Where was I this morning, Saigon-HCMC. I woke by myself at 5:45, and was getting dressed when the wake up call came. I took breakfast with the two old woman at the left corner just outside the Hotel front door. One made me a two fried egg sandwich with pate and vegetables, and the other produced dark thick sweet coffee on ice with condensed milk, all for 32kd. I dragged my suitcase across the park, saying no thanks to the usual host of taxi cab drivers and moto cowboys, and had time at Sinh Tourist to change $100 in travelers checks into dong. The teller refused to give me the full amount. She kept 900 dong owed to me, she was determined to keep all amounts below 1000. I mentioned the shortage, and she just looked stupid, pretending she had no idea what I was saying. It is strange. It is only 4.5 cents, but it is still stealing, and mistreating a foreign guest. I almost started shouting at her for the fun of it, a trick I learned in India, but she guessed right that I wouldn’t escalate over 5 cents. The bus was large and clean, but my window in seat two behind the driver was dirty. Later, when I tried to clean it at a pit stop, I discovered that the window was clean both outside and inside the cabin. The films of dirt, like little rivulets, were inside the double pane of glass, and was due perhaps to a manufacturing error. I had seat 1 and 2 to myself, and it took two hours of going north to get out of the industrial parks north of Saigon center, and into farmland again. We passed many factories, and outdoor lots filled with say, 200 bulldozers, or 30 giant cranes. We past several miles of parked industrial machinery. After two hours, we pulled into a gourmet rest stop, with a fancy gift store with bottles of Johnny Walker Red and Black, and oversized Cadbury chocolate bars for 160kd, or $8 US. I ordered a hot coffee, to help me stay awake. Farms, villages and towns moved by, and I was certainly less excited than I was just a few days ago, seeing all these sites for the first time. The land quickly changed. The rice fields were less organized, and there were more handsome, middle class shoe box houses than in the Mekong delta region. At about 12 noon, I realized that I was in good shape, and could regain a day of lost time by staying on the bus at 1pm, and going a 2nd 5 hours up to Nha Trang. Mui Ne might be one of the finest beach resorts in the world, and one of the finest places in Vietnam, but it wasn’t on the map of my story of the Tay Son Rebellion. I grabbed a bowl of Pho, noodle soup with shrimp, some spring rolls, in a handsome restaurant we used for the bus station, and moved to seat number 4, with right side window and right in front of the large window to the right of the driver. A young Canadian woman squeezed into seat number 3, right next to me, and I smiled and said, people will think we’re married. She smiled barely, but we chatted on and off for the next 5 hours, and it was pleasant having the company. I got her name at the very end, Kyla, and she is a modern dance, hiphop and jazz dance teacher from Vancouver, who sold her life’s savings account, and all her furniture, to spend 6 weeks in Vietnam and Thailand. She has a boyfriend up in the Yukon, waiting for her return. Her mother, now 66, became a widow 4 years ago, and there is an old high school classmate on her horizon. We had a long discussion about her finances. She cashed in her retirement account of $7k Canadian to fund the trip. She said she didn’t negotiate with motor cycle cowboys, she paid them what they asked for. She felt that the extra 50 cents was so much to them, and so little to her, that there was no sense in not letting them overcharge a little. There is a reason why this woman is a poor as a church mouse, since the the overcharges are usually several dollars. I don’t think she uses the motorcycle men every day, to meet a schedule of museums and historical sites, the way I do. I do try and not demand their lowest amount, but something reasonable, and sustainable. I took many photos of the mountains which came down like fingers, almost to the sea. It looked as if we would not be able to pass, but each huge finger of hills reduced to nothing just before the water’s edge. Leaving Mui Ne, I saw miles of sand dunes, and sandy soil, and then miles of dark red clay lands. Then mountains made of thousands of boulders, like a giant moraine, the size of a mountain. Many cattle went by, and I saw a herd of cattle playing volley ball. At least, there were say 25 cattle all grazing on this nice volleyball field. I made observations, such as, an 18th century army could easily move up this plain, we haven’t seen any mountains yet that would make a march north or south difficult. At Nha Trang, I said good bye to Kyla, and I got into a taxi that couldn’t find the Pho Bien hotel, and when he did find it, I thought he was taking me for a ride, since the address was different, but after driving about, we decided it was right. He called the hotel and they confirmed it, and I spent 38kd, when the hotel was actually one block from where the Sinh Tourist bus dropped us off. I thought the driver was trying to make me go to his friend’s hotel, when actually, the guidebook put the wrong location on its map. The room is disappointing. There is no writing table, and the air conditioner goes off with the lights, when you remove your key from a keyholder required to be filled to get the outlets working. I found a cute little place around the corner, and had a pot of seafood and onions and tomatoes soup. Then I walked around the block, looking at all the fine stores and restaurants, and came back to the Pho Bien to work, at about 8:45. Just outside the hotel, a moto cowboy asked if I needed anything, like a woman, and I just said no thanks and kept walking. He was a dark faced, hard looking man. Saturday, November 13, ’10 Ups and Downs, Nha Trang to Quy Nhon. This was a difficult day, partly because I made some weak choices. I slept in, till 6:45, even though I had woken at 6. I walked to the other side of my block, to a cute open air restaurant with a dual language menu, and ordered black coffee for 10kd, and bread with butter and jam for 25kd. Vietnamese coffee is magnificently strong, and they brought it in a little one cup straining device, with a steel thermos of extra hot water. The butter was from New Zealand, and the 8” baguette could have been produced in Paris- great breakfast. I called Mai Linh Express, and the only remaining express bus to Quy Nhon was at 3 pm, for 4 hours. My hotel lady suggested I go to the town bus station on a motorcycle ride, and buy a ticket for Quy Nhon from one of the local companies. The girl at the bus station said that the buses were every half hour till 2:30, which turned out not to be true. I renegotiated with my cycle driver, for 100kd, to take me about 5-6 killometers further west to the Thanh Citadel, cua Dong, cua Tay, to see sections of the old town citadel built by the Trinh in the 1600’s, and rebuild by Prince Nguyen Anh in 1793 during his offensive against the Tay Son. The wall was about 12 feet high, but the top was wide, maybe 8 feet, and the gate in the middle had a large arch, with a pagoda type set of double ceilings above rooms making a tower. I took a bunch of pictures, and wondered why mounds of dirt rounded out the walls on both sides. I think the dirt mounds came much later in history, after the citadel no longer functioned. It makes no sense to let your attackers scale your wall up a dirt mound. In 1773, that mound was probably a moat, bristling with bamboo staves pointed at both ends and driven into the moat bottom. My driver was excited by the fact that I was so excited, and he insisted on taking me further west, which worried me, but he kept saying Tay Son, Tay Son, so I let him drive me west a half mile, and there was the other wall and gate, exactly like the first one, since these fortresses were usually square. The East and the West gate survived. I think cua Dong, cua Tay means Gate East, Gate West. I asked the driver, Thome, if we could stop at the Long Son Pagoda, since we had past it, and it is huge. He agreed, and I spent a good 20 to 30 minutes exploring a very large complex of buildings, statuary, art, and a variety of scam artists pretending to be Buddhist monks or their fundraisers. One decrepit old lady wanted to get paid for watching my sandals while I explored the main temple, a giant rectangular building with a ceiling almost 3 stories high. I caved and gave her 2000d. I passed on the adult orphans with the post cards, the priest who wanted to show me around and take my picture, and the little girl who wanted 50kd to buy her plastic fan. It was amusing at dinner tonight to read in the guide book about all three scams, I got hit by all three, and fell for none. Thome took me home, and earned a small tip, even though 100kd is over a day’s wage. I visited the beautiful beach, and then returned to my Hotel, and dressed to swim, leaving even my glasses at the hotel. I swam in the ocean for about 7 minutes; the water was about 7 degrees cooler than at Ha Tien, in the gulf of Thailand, and it was cool enough to be refreshing. The undertow as I left the surf was strong and a little violent, but not dangerous to adults. Since I was past the 11 am check out, I hurried home, showered, packed and checked out. Here is where I goofed. I found a little open room restaurant, and had rice with beef and tofu, and lost track of the time. When a taxi dropped me off at the bus station it was 12:28, and the 12:30 had just pulled out. After 12:30, the buses are only hourly, so I had to kill an hour, loaded with luggage. The ticket master of the 16 seat Ford van said I could sit in the front seat. Just before we left, a couple shows up and demand my seat, since their tickets said seat 1 & 2, and mine said seat 3 behind them. I acquiesced graciously, wondering why the girl didn’t ask me which seat I wanted, since I was an hour early. This became the bus ride from hell. We drove half way out of town, about 5 minutes, and the bus pulled up to a small open restaurant to pick up a woman and her children, and there was an argument about the price, and that the seats were already taken. The driver and the ticket master sat at the restaurant and ate lunch. I was so angry, I wanted to show them my imitation of Jesus thrashing the money changers at the temple. By the time they finished their lunch, 3 more men showed up to board the van. A cute Viet girl joined me and two ladies in the 2nd row of three seats, so now there were 4 of us sharing. We chugged along, and the bus kept jamming more folks in. I counted up to 27 bodies in this van for 16, and for the fourth hour, I was jammed against 3 people. For several hours I was pushed up against the cute Viet girl, who spoke some English, and who gave me her name, Nguyen Thi Hong No. No means something like throat pin. We were close enough physically to feel married. For that 4th hour, 3 men were crammed into the slot between me and the sliding door, so I could no longer see out my window to the East, as we were going up one of the most beautiful coastlines in the world. There were many signs of severe flooding, and there were many potholes in the road which slowed us down, but the driver was a bloody maniac, and we are lucky to be alive. It was a two lane road, Route 1, with a cycle lane outside each car/truck lane. Our driver insisted on passing everything in front of him, even when the road was bending to the right, and he would pull out to pass a huge 18 wheeler, with no visibility of the oncoming traffic. He and the ticket master both chain smoked, and both talked repeatedly on their cell phones. For the first 4 four hours I did get to see the beautiful country and coastline- my god what a country. Huge mountains would appear to come down to the sea, but we would skirt around them, with the ocean and islands to our right, and find a huge valley to proceed north on, only to repeat the process. Near the end of the light, we hit some mountainsides all the way to the beach, and our road was cut into the side of the mountains. I was just furious with myself, that by not starting earlier, I had these punk maniacs, in a circus van with too many clowns, and missed the final hour of geography into Quy Nhon, because it was too dark to see. Sitting there in the dark for most of an hour and a half, I had plenty of time to realize that I could of left my hotel and gone straight to the bus station, and then bought a sandwich at any number of shops. It was pitch dark when we pulled into Quy Nhon at 6:30 PM, and pitch dark was my mood. I took a taxi to the HAGL deluxe resort the guide book recommended, because they had single rooms for $22, but that was last year, now those rooms were $45. But for me only, $35. I left, and the bell hop recommended a place, as did the desk clerk. I went across the street to the Hung Dong, which is $6.US a night, but the room smells of smokers and mildew, and I will move tomorrow morning. I picked a restaurant for fish from the guidebook, Que Hong, and it was at the north end of the strip, so it cost a $2.50 taxi ride to have a $5.00 meal of fried cut fish and rice with assorted seafood bits, an orange drink and a beer, and justified the ride. My guide book said that up in this north end of the strip, was a place called Barbara’s Kiwi Connection, hotel and free travel advice in English. I walked a pretty mile, in a part of town that was mostly closed for the night, but I met Barbara, who is in her late 60’s, and she gave me great advice. Just hire a motorcycle driver, she said, to go to Tay Son, now called Phu Phong, 51 kilometers to the west, so I can look at the countryside while someone else watches the road continuously. She said she might have a driver for me who was fluent in English. She lost her hotel to a developer, but she sent me next door to the Lan Anh 01, at Dong 102 Xuan Dieu, Qui Nhon. I looked at a room on the 4th floor with a balcony overlooking the entire bay, and bath tub for the shower nozzle. It was 250kd, or $12.50/night, I said I will take it tomorrow morning. Barbara appears to be a treasure trove. I caught a taxi outside the Lan Anh, and though the driver seemed gentle and nice, I had to remind him to turn on the meter. The charge was 48,600, and he did not offer me back my change from a 50. I wondered if he wanted to leave the fare off the meter so he wouldn’t have to report it, but I would have had only a vague idea of what the drive should cost. I don’t care for the smell in this room, but even the new place I move to allows smokers, and has a dank quality, due to the fact that it is 70 yards from the ocean. Tomorrow, I will change hotels, go to Phu Phong to the Quang Trung Museum, explore Tay Son, and then think about how much longer to stay here versus going to Hue. I’ll weigh going to Hue. I woke late, around 6:45, and walked over to the park, café and beach outside my Hotel, the Hung Dong. There were two old neglected tennis courts, one net was down, paint flaking. Must be public courts, or belong to a failed business. It’s possible they belong to the fancy resort next door, which let them go from lack of interest. I packed, checked out and took a cab to the Lan Anh Hotel, took a room, and met Barbara Dawson, of Barbara’s Kiwi Connection Café. Their establishments are connected by an open passage way with no door or gate. Barbara is a lively and vibrant woman and we talked, then I ordered breakfast, and we talked more. I had a great breakfast of 2 pots of plunger coffee with milk and sugar, and two large banana pancakes the kiwi (New Zealand) way. Looks exactly like a French crepe. She made a phone call on my behalf, the Quang Trung museum in Phu Phong, the new name for the old village of Tay Son, was open on Sunday after all. She had her motor cyle man on standby, so I packed up and Fie took me on a two hour ride up very small roads to Phu Phong. We went to a noodle shop and had Pho with beef, all while a horrible US war movie was on the TV above us. I used the WC, or Water Closet, or Ve singh, and it was a shower stall with just a drain in the corner and a tub of water with a large cup, and a pile of excrement against one wall. I studied the situation, and figured out that this was the original Water Closet, before it became the Turkish toilet, a basin on the floor with two places for your feet, so you squat. I peed into the drain, and wondered if a woman just pees on the floor- you use a scoop into a bucket of water to flush the closet floor. Fie would not enter the museum with me, in spite of my pleas, so I went through it alone-so much for my expensive, English speaking guide. Several gold statues maybe 15′ high presented the viewer with the three brothers. I took notes, but most of the texts, all the big scripts on the walls were in Vietnamese only. I was done in 2 hours and 15 minutes, because I knew what interested me, and 4/5ths of the writing I couldn’t read. I noted that in the Temple of Quang Trung, where you took off your shoes, I was ordered by a guard? Or beggar conman, not to take photos, so I didn’t in the temple. I noted that Ho Hue’s top mandarins wore the traditional caps of ancient china, skull caps with roofs on the top, and ears out the back parallel to the ground. There were some great paintings of Hue on top of his war elephant. In one, he stood on a platform, pointed with his sword. In an other drawing, he sat on a throne on his elephant, and gave his orders. Fie and I decided to go to one of the Cham Towers, since it was nearby, and we’d be home by 6. The towers were being restored, so they were covered in steel scaffolding. They were tall, 3 to 4 stories high, and needed a lot of work. To my horror, we went home a more direct route, but full of idiot truck drivers playing leap frog, and the road was full of exhaust pollution, and Fie took me to the other Cham towers, since his English is almost as bad as my Vietnamese. This cost a half hour, and as we left the 2nd batch of towers, it started to rain, then pour, and we had a miserable last hour driving home in the pouring rain, and in the dark to boot. Still the dam trucks and buses were playing leap frog, so to pass each other, they would be driving right at us in our lane. Today, I came up with a moniker for my idiot bus driver from Danang to Hue, Pig Bus Driver. Back at my hotel, I showered in cold water, and I had to redress and get help. The young man showed me an electrical switch, unmarked and outside the bathroom, which turned on the hot water heater. I checked in with Barbara, she couldn’t have dinner with me since she was on duty, and so I went next door to the fish restaurant, and stupidly ordered crab. It takes a while to dissect and eat a hard shell crab, and I wanted to get back to talk to Barbara. I ate that crab in record time, but she and I had only 15-20 minutes before she went home at 9 pm. I asked if she wanted to read my novel, she was interested, and we discussed my leaving my manuscript, since I was tired of lugging it around. Later that night I reviewed all the rewriting in the first 230 pages, and decided I couldn’t risk losing all these rewrites I’d done, so I threw the book onto a thumb drive, so I would have something to offer her. I packed, and went to bed, knowing I’d ordered a wake up call for 5:30, since MaiLinh Express was picking me up at 6:30, for their 7:30 bus to Danang. I paid my bill that night, and the woman wouldn’t give me back my passport until she’d inspected the room. She didn’t believe I hadn’t used the mini bar. I apparently took the larger bag of Mango Chips, belonging to the hotel, by accident, and I handed them to her, since I hadn’t eaten them, in exchange for the smaller bag, which was a freebie in another hotel. The surf of the ocean made a wonderful, rhythmic clash that penetrated the wall and window of my room. The north end of the bay was full of complex circular fishing nets, that stuck out of the water. 5:30 AM came quickly, and I washed, shaved, and moved next door to Barbara’s for coffee and baguette with butter and jam, all served by Fie. He was cheerful, in part since I paid him $20 US for 6.5 hours of work the day before, including a two hour break, which his girlfriend had insisted was the price, and Barbara had said it was the normal rate. I should have insisted he translate in the Museum. Barbara sat with me while I finished my breakfast, and said she was looking for a buyer for her café, and had three nibbles. I questioned her, and she wants $100,000 US, to replace what she has sunk into the business. Her income is negligible though, maybe under $5,000 per year, so I’m afraid the business might be worth no more that 50,000. 5/100,000= Return on equity of only 5%, when it should be 20%. If 20% is your goal ROI, then the business is worth only $25.000. If she took 10 or 20 % of each job she set up, she could make the numbers. My suitcase would not fit in the back of the Mercedes Benz 16 person van, so I had to put it in the aisle, blocking in the last 2 rows of people. I had to sit in the middle of the last row, but got to talk to an attractive polish couple, and the views were spectacular through the side windows. Lots of mountains coming down to the sea. We were stopped by a police man, on a trumped up charge probably, and we saw the driver give him several bills. The young Poles will travel the world with their backpacks for over a year. They loved Tibet. A little Viet Grandma asked me if I would like to switch seats with her, she was in the 2nd row by the door, and I sat next to her daughter in the back. I readily agreed, and suddenly I had leg room, and the whole front windshield to look out of. I lost my Polish couple, but they had no interest in Vietnamese history, so our conversation had ceased long before. They had said that Ireland was on the brink of going under, and they discovered in Spain that the Irish all came to the same resorts there, year after year, sticking with their own crowd, and knew almost nothing about the world beyond their own. Americans are also quite insular and ignorant of the world, I said, and that was how we became instant friends in the beginning. We stopped at 11:30 at a Mai Linh cafeteria and gift shop, and I had fishy fish, like mackerel, with rice, soup and vegetables, in a plastic tray with little compartments, all for 25,000d ($1.25). They probably fed over 100 travelers in that one half an hour. I noted rice fields that were submerged, into mile wide lakes of water. The flooding of the region had been severe, with 24 reported deaths. It started raining, then pouring. It was pouring at the bus terminal in Danang. I caught the local BX bus to Hue with 10 minutes to spare, it left 15 minutes late, and the fat woman charged me 50kd. I got off the bus and checked at the ticket counter. The ticket was 40kd. It’s a buyer beware sort of place. I was another minor victim of the let’s bleed the tourist frenzy that affects most in the tourist industry here. I should have recognized the trap, when she acted like the bus was leaving, and I had to hurry, when it wan’t, and I didn’t. You should never approach a Viet ticket master, without knowing the posted price. The extra 10,000d is only 50 cents, but it is the principle. And if it was an extra $50 or $5000., the principle would remain. The fat lady did invite me to sit in the seat right behind the driver. The bus was almost full when we left, and they added 10-15 more before we left town, so the aisle was full, and the engine block, and the door way. I was jammed in, and it was raining hard, so it was hard to see the world go by. We entered my first tunnel, and it went through a huge mountain. I got a chance to see up close what an idiot our driver was, passing two or three trucks, going up a huge hill, unable to see what was coming at us around the bend, and trying to get back into the right lane in front of the vehicle he was passing, before hitting straight on an 18 wheeler coming right as us. We saw one large truck turned over on its side, and 3 others sitting dead with engine trouble. This was when I coined the term, Pig bus driver. The flooding on the road to Hue was impressive, eapecially after Danang, and it rained hard for several hours in the afternoon. There were rice fields turned into lakes with electrical poles marching across the lakes, each perhaps a mile square, over and over many times. The bus stopped to let someone off, and a guy jumped out to pee right by the side of the bus in full view of the passengers. I jumped out and joined him, because it was time. 20 minutes before we reached the Hue bus station, we stopped at a big gas station and many folks used the rest rooms. Apparently one of the women had signaled she needed to stop. I picked out 4 hotels in the guidebook, and rated them 1-4, and wrote down the address on the first on a piece of paper. In the pouring rain, I ran out in my raincoat, wrestled my big suitcase out of the back, and got in the second cab. He made me take my rain coat off in the rain to keep it from wetting his car. The Binh Minh Sunrise Hotel is lovely, and I went next door for a dinner of Indian food, after checking email. Nice to hear from my daughter! I came back to the hotel and wrote emails to my two Viet contacts in Hue, one through Professor Quang Van Phu of Yale, and the other through Barbara Lamb. I started my journal, and an hour later Truc Linh called me at the Hotel. Quang’s friend wants to meet tomorrow, and take me to libraries where I can read more about the Tay Son. I’m afraid my desires are more basic, I want to see the Citadel and the Spring Palace and the Imperial Enclosure. Tuesday 11/16/10 day 13. 7 remaining to get to Hanoi and see it, and it is 12-15 hours away by bus. I need to describe the geography of the trip to Tay Son yesterday. I will make brief comments, then look at my pictures and possibly write more. We cycled into a very small road, passing a land of sand dunes. The coastal region is on top of sand. Coming into Quy Nhon, I saw huge hills of boulders, like giant piles of granite pebbles and rectangular stone. Some mighty glacier had been here before. We passed many fish farms on the right, and pine trees on the left. There were many pine trees, looking like white pine, but spindly- like Japanese paintings. The forest was never very dense, but there were many villages, many people. When we got to Tay Son, in Phu Phong, it was at the end of a plain of rice fields, at the base of the central highland mountains. 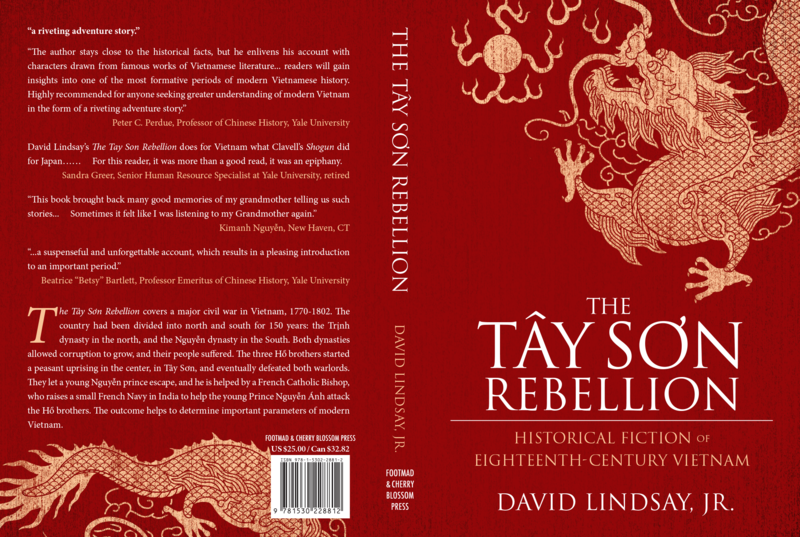 This is important, because the Tay Son used the highland ethnic groups as allies, says George Dutton, in his new history, the Tayson Uprising, that came out just 2 years ago. A relief map in the Quang Trung Museum shows that the mountains go on and on, they start just beyond Tay Son. After we left Danang, which is surrounded by big mountains, we entered a tunnel, that was over a mile long, into a huge mountain, and then we climbed up and down a series of 3 or 4 more very big mountains. The driver upset me, because he was a Pig bus driver, and was risking our lives, to cut a few minutes off the trip, by passing trucks, when he couldn’t really see what was coming in the other lane from the other direction. I took pictures, but just for reference, since you see the inside of the bus in most of them. Waking up 1l/16/10 in Hue. I was at the Binh Minh Sunrise Hotel, and I slept in on purpose, till 7, when the phone rang, and Truc Linh cancelled our date for 9:30, it had rained all night, and was still pouring, and his home had become an island, and he didn’t have the stomach to motor bike 8 kilometers in the deluge. This was good for me, since I wanted to see the Citadel of Hue, and the Imperial Enclosure, and the Halls of the Mandarins, and the Forbidden Purple City. I enjoyed the hotel breakfast, included in the price of the room, which at $20 is as expensive as HCMC. The coffee was good, but the toast was like over toasted wonder bread- crouton material. I walked to a bank, and changed my remaining travelers checks, $150. US, into 3 million Dong. 2,882,100.d. The commission was $2.20, about 1%. so this was the best rate I ever got for traveler’s checks, I wish I’d brought a $1000., not $250 of them. It was tricky leaving the Hotel, because of flooding, you had to get your feet wet, there is about a foot of water in the street here, so it has run up onto the sidewalk of our hotel. I locked away most of my 3Million Dong in my suitcase, and decided to just wade in the water out front, since the smell in my room last night turned out not to be the desk, but my sandals, so I splashed about in them crossing the steet, and planned to shower in them tonight. I found the street to the Perfume River, which is substantial, almost half a mile across, and I purchased a small umbrella to keep some of the pouring rain from hitting me. The Citadel wall was just a block in, but I had to argue with a number of pushy cyclo drivers (bicycle rickshaw), who desperately wanted my business. One guy kept saying we should tour about, because the ticket office for the Imperial Enclosure was closed till 1:30. The guidebook said it was open all day, but I offered the poor wretch 40,000d to take me to the entrance, after he’d followed me for 10 minutes. He took me to an entrance that was closed, but had no signs, so I realized I was with a con artist, but I gave him his 40k, out of a growing pity I have for all the bicycle men. They are losing most of their business to the Motorcycle men, who can do any distance much faster. They are so pushy, because they are starving. You can tell that they are desperate. Many of them come from families that supported the Bao Dai (Nguyen) regime, the French and or the Americans, and they are not allowed most other kinds of work by the communist government, which Barbara says employs about ½ the population. I walked along the wall for a long time, it is a big Imperial Palace, and came to the main entrance, where I paid my 55kd, and entered. It’s big. The Citadel of Hue, is an old city behind a wall that is two stories high, and 2 meters wide. The Imperial enclosure, Phu Xuan, or the Spring Palace, is enormous in that it is like the Forbidden City of Peking. It is 2.5 kilometers squared, and it is just palaces and gardens for the Emperor and his ministers to meet and rule, and for his family and concubines to live. The emperor had four long dormitories for his concubines, a large palace for himself, another for his wife, and others for the grand-parents. My immediate question is about the Thai Hoa Palace, the Palace of Supreme Harmony, built in 1803, ( just after my book ends), by Nguyen Anh, the victor of my story. It has a large throne on 3 levels of dais, but infront of the throne, is a large table, and 3 large sculptures. I wonder if visitors, who are expected to kowtow, have to stay 30 feet away, with the table and objects between them and the throne. You would have to speak loudly and clearly for the Emperor to hear whatever you had to say. The Lonely Planet guidebook 2009, says, “The enclosure was badly bombed by both sides during the American war, especially the vicious battle of Tet in 1968, and only 20 of its 148 buildings survived. “ It goes on to say that while the government is restoring some of the buildings, it is ambivalent about the royal Nguyen Imperial past, and is not pouring any resources into the job. In this huge monument, I found only two toilet stalls, unkempt, and unmarked. I could spend a lot of time describing each section that I identified, but much is in the guidebook, and much I couldn’t figure out. By the end, and after listening to a Viet tour guide speaking in French to 30 customers, I learned that the big empty space behind the giant audience hall was where the Emperor’s private living palace was. It is a bare courtyard now, with a few pillars sticking into the sky, all that’s left of one of the finest palaces ever built in the country. I had some nice exchanges with other tourists, there were hundreds at the site with me, but it wasn’t crowded. There was a traditional theater, that confused me, since it had a stage, with a small dais, and throne, at the back of the dais, and there were red chairs facing the stage. I raised my concern with a guide speaking in French to his clients, and he said that the chairs were for current performances, but when the Emperor used this theater, where all the chairs were placed was actually the stage, where the dancers and opera singers performed. The emperor and his family were on the dais, and other guests were up in the balconies. Sometimes I learn very small details. In one of the halls for the Mandarins to prepare their appearances, there were items on display, including very old photographs. In one, it was of officials eating at a royal banquet in the huge assembly palace. The long tables were on both sides of the head table, assuming the Emperor even attended such a banquet, and the mandarins all sat on only one side of the long tables, so they all faced the emperor while they ate. It was not a cozy, friendly, informal arrangement. I went back to the great model of the all the 148 buildings, in miniature, and listened to another Viet guide speaking in French. I followed along. He pointed out a palace for each import family group: the parents of the king, the parents of the 1st wife, the 1st wife herself and her children, the 2nd wife and her children, etc. I’m stunned by how big this place is. In one photo, there are about 50 court officials, all in official robes, attending the Emperor. This style of government was destroyed by revolution in China, because it was expensive and rulers seemed out of touch with the ruled. The Viet government system was modeled almost exactly to follow the chinese model, and had a similar fate. It was destroyed by a revolution. I wonder if the Bao Dai government was doomed from the start, by emerging from such an antiquated and inefficient and systemically insensitive system. Servicing 4 dorms of concubines would sap the energy of any vigorous leader. At one point, I was so tired, I bought a warm Coke for a dollar, to get the caffeine and sugar. When I reached the opposite wall, there was an open gate, and across the street were houses and noodle shops, across the moat of the Citadel. I asked the guards if I could run out and eat, and then reenter on my ticket. They said sure. I’m getting good at sign language, since most of these guys speak little English. I had a great bowl of Pho, Noodles with chicken, and two coffees, for 60kd. It was expensive, but it was raining again, and my feet were getting sore from walking in wet sandals, and it had outdoor tables under a roof. The guards had changed, so I had to act out the whole drama, and produce my paid ticket in order to get back in. I left the Forbidden Purple City, where the family and concubines and eunuchs all lived, then left the Imperial Enclosure, which I think is called the Spring Palace, though the ancient Spring Palace was 8 kilometers to the north. I was adopted by the homeliest cyclo driver, who was desperate, and followed me around like a dog, since I looked footsore to an experienced eye. I visited the decorative cannons, sad testimony to the arrogance of the Viets, making giant, 15’ decorative cannons that didn’t really work. He wanted a 100kd, then 50. I realized that my feet, in wet sandals, were so sore, they were almost bleeding, and I stopped to put on socks, but had forgotten to pack them. So I negotiated a ride. For 40kd, he could take me to my hotel, no excursions, and he was delighted. He should be able to care for a family of 4 for a day on 40kd. During my late lunch at the noodle shop just outside the far wall of the Imperial Palaces, I witnessed a beautiful moment. A woman on a motorcycle wearing a bulky black rain poncho went through the puddle of water in front of the restaurant, and suddenly, a little girl, 10 or 12, threw up the poncho she had been buried under behind the woman, looked out with delight, so pleased to not be sitting blind in the dark anymore, and yet she also looked surprised or scared also, by the bright light and the traffic. And then they were gone, and I just remembered the young girl’s smile of excitement when she threw off her plastic veil. I thought it would have been a great photo, but it was before me for only an instant, and was gone. My cheerful cyclo driver pedaled me slowly over the Perfume River. We passed by a woman on a motorcycle, and I thought she looked nice. The streets were all flooded with water, and she was wearing a rain poncho, and she didn’t look properly dressed for the weather. She was dressed up for a dinner party. I looked down, and noticed that she was wearing stockings and very high heels. Wednesday 11/17/10 The beginning of week 3. Last full day in Hue. I hope we can meet, and I was wondering if it could be today. If you send me your phone number, I will call from Binh Minh Sunrise Hotel, tel 84.54.382-8362. I will go out shortly to investigate buses and trains to Vinh, and then Hanoi. My goal is to travel during the day, so I can see the country. If I leave tomorrow morning, I will have 2 travel days, and I will have 3 days in Hanoi to see 18th century sites and museums, maybe I will need only 2 days, I’m not sure. I’ve heard the museums of 18th century are very small there. I must catch an airplane to the US next Tuesday morning the 23rd. I hope we can meet today, and I can certainly come to where ever you wish to meet. This note had the effect I desired, and I politely copied Truc Linh, who wanted to postpone a few days, till he had better boat service. But first, I walked to the train station, which the reception girl said was ½ a kilometer away, and it was a spectacular walk along the Perfume River, with the Citadel wall on the other side, but is was actually 2 kilometers, and took 20 to 30 minutes of wondering. The train would leave at 10, and cost 99kd, take 9 hours, and this was without explaining whether I was getting a soft seat, a hard seat, a soft berth, or a hard berth. I’m sure I wasn’t quoted a bed for a day trip. A quiet older guy, I’m afraid to say, my age, probably a vet, offered me his services, and I said I wanted to go to the Bus Station, then back to my hotel, and gave him the card for the Binh Minh Sunrise Hotel on Nguyen Tri Phuong Street. How much? 30,000 dong. I looked at him with shock. Really, that’s the right price. OK I said, and look at him again. He was lean and dark, and laid back, thin as a rail. He was the first moto driver to just give me the going rate. He had an oversized helmet that actually fit my head. First one large enough to fit. We went out to the Bus Station, and most of the ticket sellers were out to lunch. The few remaining said over and over that there was no bus here to Vinh, and they gave my driver a card, saying here is the bus. We followed the card to a travel agency back by my hotel, and they had a night bus only for 230kd. He still got a 33% tip. I went back to my hotel, and I found a Sinh Café Services, where a nice young man said I needed the North Bus Station, since they handled buses going north. I had an email from Mai Khac Ung, giving me his address, and asking me to call his neighbor, Ms. Oanh. She was his translator, and she said I was welcome, but not for lunch, but after. So I said between 2 and 2:30 and went next door to a little Viet Restaurant that I hadn’t tried yet. It was overpriced at 60kd, but I got a great shrimp and vermicelli, with stale chocolate pound cake and strong coffee. I packed carefully, taking the contents of my novel, and the new Dutton book on the Tay Son. I bought a flask, a 175 ml bottle of Wall Street, Blended Scotch and Vietnamese Spirits, for 100kd, in case I needed a gift after all, and searched out a moto man who’d groomed me earlier for his business. I needed to go North Station, and then Nguyen Phuc Nguyen street, next to the famous Thien Mu Pagoda. He wanted a hundred, I said it was only 30. He said 50, I said, its only 30. He said no. I said I would look around, and the other guy at the corner took the job. I think he regularly took business away from his corner mate, who only wanted big fish. The North station was way up the road, and my driver went 60 kph to get there, which means any accident would have killed us, but the roads were not too crowded, and I found out at North Station, Ben Xe Phia Bac, Bus Station Direction North, that there were buses every hour from 6 to 10 am, for 100kd. I’ll shoot for 9. My racing car driver took me to Nguyen Phuc Nguyen Street, and it was far out, and hard to find, we went by it at first, and passed the Thien Mu Pagoda, but retraced, and went up an ally, and there it was, a small new mansion. While I was paying the driver, a spry looking wild man was walking about. Mai Khac Ung is a mixture of my cousin Peter Lindsay and Yoda. He seems at first to be near my age, but he told me later he was 77, and very proud of it. The house is spacious, and gorgeous, and full of fine tiles and precious dark woods. The kitchen is almost American, large and modern, with all the conveniences. I took off my shoes, and left them inside the front door, with all the other shoes of the house. Mai Khac Ung speaks very little English, but he worked for many years as a museum curator, and he has had numerous books published in Vietnamese. He is an expert on the Tay Son, and especially on Emperor Ming Mang. Ms. Oanh was an English teacher in an elementary school, and her English was sometimes hard for me to understand. It appears that the commitment here to English is somewhat ambivalent. But she was attractive and charming, and at some point, Mai Khac Ung said mischievously, that he really wanted an American husband for her, and for some reason, I didn’t think he was entirely joking. We talked and talked, and I asked questions, and described my book, and always, Ms. Oanh had to translate both ways. Before long, Ung was running up to his library, and pulling his books off of his shelves, to show me his published works. Most were in Vietnamese only, but one “Emperor Minh Mang’s Mausoleum” had a companion book with abbreviated translations in French and English, and he immediately presented me with an old stained copy of one of these as a gift, already inscribed by the author. Then he asked me to carry a book to Quang Phu Van, who is really Van Phu Quang, since in Vietnam it is in the order of Family, Middle, First name. I couldn’t refuse, all though my suitcase it already heavy. I showed him the George Dutton book, and I made Ms. Oanh explain that I was writing historical fiction. He agreed that this gave me a great deal of freedom and license. I showed him my sketches of the Thai Hoa Palace, the great reception hall, or the Palace of Supreme Harmony, and I wondered how people met the Emperor, since infont of his dais, was a large table, and before that were sculptures of lions and urns. It took a while, but he finally made it clear that the Emperor only met his Mandarins in this hall, and they stood on either side, in long ranks, in 18 rows, since there were 9 grades of Mandarin, and 2 levels in each grade. While still in real power, the Emperor never met with ambassadors, they had to meet with his minister of foreign affairs, equal to equal. We had a big discussion about the size and dimensions of the Phu Xuan Palace complex, inside the Citadel. He drew a picture. The Citadel was 2600 meters at each wall. The Palaces of Phu Xuan were inside walls of 600 meters. The Purple Palace for the women and children was inside walls of 300 meters. Outside the citadel, a house was built for his minister of foreign affairs to meet with ambassadors. They were not even allowed inside the Citadel, or walled city. I showed him my sketch of the Thai Hoa Palace. I reviewed with him the 5 standing bows and the 3 kowtows that I saw worshippers do in a Buddhist Temple in Nha Trang, and he said: The mandarins had to do 5 kowtows to the Emperor on their knees. Sons and daughters, when their parent dies, they do 4x to the shrine of the parents. Buddists are expected to do 3x to buddhas. The standing bow with the hands raised is less formal. The hands symbolize the heart, or the Lotus. Standing bows are about communicating ones deep feeling, showing appreciation. Very soon after I presented Ung with the small bottle of whiskey, he invited me to dinner, and I accepted, and his wife soon got up and spent the rest of the afternoon preparing a home cooked meal of 2 dozen or so pork spring rolls, fried beef and chicken dishes, rice, and fresh mint from his garden. Before dinner, I used the bathroom, and Ung and I went outside the backdoor and toured his garden, which was extensive. He picked some herbs for the meal. He had slipped on toe thongs to go outside, and as we came in, he asked me to go into a side room and wash my bare feet. There was a stool by a shower drain, with a tub of fresh water and a scoop. I was embarrassed, and I noticed that the floors in his house were immaculate. The Ho brothers father was named Ho Phi Phuc. His father or their grandfather was Ho Hung Dat. We finished the small flask of whiskey, Ung kept making me clink glasses, but he had to correct me. Since he was my senior, I had to hit the rim of my little cup under the rim of his. Our clashes demonstrated the natural pecking order of the Confucian society. He told me that Van Phu Quang calls him Uncle out of respect, ( since he is the elder). He would return the respect by calling the younger man nephew. Before dinner, Ung would go off looking for another book to show me, so I made conversation with Ms. Oang. She teaches English to grade 3, for example, for just 70 minutes/wk. Her students, grades 1-5, only go to school from 1:30-4, or 2 and 1/2 hours per day, five days a week. Most middle schools, grades 6-9 allow for full days. Ung showed up with a handful of his books. In Vietnamese, they were: Agriculture in the Ming Mang Period, Tu Lien Ve Nguyen Cong Tru, Backgound of the Nguyen Cong Tru ( a famous poet of 1778), tham cua Thien Mu Pagoda, the Pagoda next door. He mentioned a book about the Tay Son, and Back to the Source, which he presented to me as a second gift, on the folk arts of the Hue region. Khiem Lang Va Vua Tu Duc, his book on Emperor Tu Duc. I told him about how I used the tale of Kieu, (Keeow) Kieu Truyen, in my novel. He wanted to know if I knew about Pierre Pigneau, and I talked about his biography. He mentioned with excitement that Pierre has a tomb in Saigon. It is not mentioned in Lonely Planet! They should take note, since he helped engineer the Nguyen victory over the Tay Son, and for over 20 years, was Nguyen Anh’s military advisor. I wanted to know what happened to the original Phu Xuan palace. He wrote that the first was built in 1687, the second was in 1804, and Nguyen Anh, took apart the old palace,which was a thumb print inside the new place, after he built the new Palaces, since he felt the old was too small and decrepit. There were not 4 dorms for the harem women, the concubines, there were 6. At some point, he asked if I would drink more alcohol. Our little flask was empty. I said, I will if he will. He got out the , that I’ve read much about, the Viet white lightening. He said it was 100% alcohol, and I suggested that it was probably100 proof, since it had taste. He said it was made with tiger bone, and I said that was too bad, since I think tigers are an endangered species. My translator couldn’t handle this, so I drew an X And Y axis, and graphed a tiger population over time disappearing, and they both understood. We each had a small cup or two anyway, the tiger was already dead, and then he chugged the 3rd cup, and bid me do the same. This was a signal that the evening was over, but I didn’t realize it till he was explaining that he’d called a neighbor to take me back to my hotel by Moto. His neighbor was clearly an amateur, since his tires were under inflated, and he had no 2nd helmet. Lonely Planet says I am responsible for the fine if my driver doesn’t have a 2nd helmet. The police go after where the money is. He couldn’t find my hotel, and asked for directons 4 times. I knew where it was, but he wouldn’t listen to me. I gave him 20,000 dong, as instructed by Ung when I asked his advice. I will cherish my visit to Mai Khac Ung, his wife and Ms. Oang, as the high point of my travels through Vietnam on this trip. Hue has been a fascinating place to visit, inspite of the rain and flooding. I really liked the Binh Minh Sunrise Hotel. It is the best place I have stayed in Vietnam, and it was an “our pick” in Lonely Planet that I agree with. Tomorrow is another moving day- on to Hanoi.